For the second year in a row The Swedish Pensions Agency is one of the "5 Best Government Agencies of the Year Online". In the competition Topp100, Sweden's 100 best sites, apps and network services are appointed each year in several different categories. The sites are judged based on speed, smartness, experience, security, navigation and more. 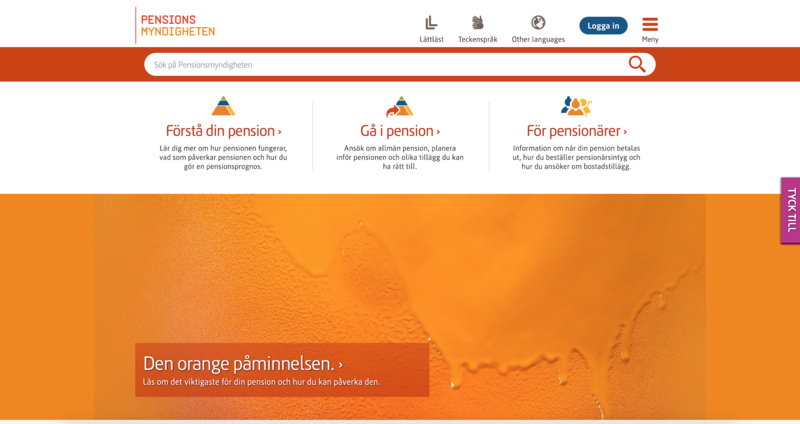 For more than three years, the Swedish Pensions Agency has worked with the digital agency Maverick by Sigma to develop the best UX and design solutions with a focus on user-friendliness, brand design, and accessibility. – We are very proud of the cooperation with the Swedish Pensions Agency and all the awesome solutions we have developed together. It pays off to work with user-friendliness and accessibility in the long term, says Henrik Askervi, head of Maverick by Sigma. The competition is organized by IDG.se in connection with Webbdagarna event and expo and was presented on March 18th 2019. Maverick by Sigma is Sigma IT Consulting's digital communications agency and specializes in solving customers' communication needs through digital strategies and creative digital solutions. Maverick by Sigma's main areas are: Digital Strategy, Change & Learning, Web & Portals and Unified Commerce.